Graduate Hospital or Southwest Center City (SWCC) is a residential neighborhood in South Philadelphia that borders Center City. The neighborhood is bounded by South Street to the north, Washington Avenue to the south, Broad Street to the east, and the Schuylkill River to the west. Directly adjacent to Graduate Hospital are the Fitler Square, Rittenhouse, and Point Breeze neighborhoods. The neighborhood is comprised mainly of nineteenth and twentieth-century rowhomes, historic churches, corner stores, coffee shops, and gastropubs. 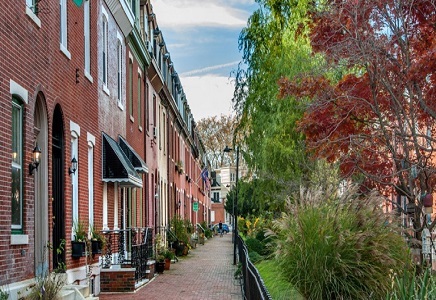 Residents can enjoy outdoor activities along the Schuylkill Trail or a short walk into Center City to enjoy Rittenhouse Square’s shops and restaurants. Graduate Hospital also has the distinction of being featured in M. Night Shymalan’s The Sixth Sense. The median sales price for homes in Graduate Hospital is $470,000 with a price per square foot of $379. The median rent per month is $2,190.